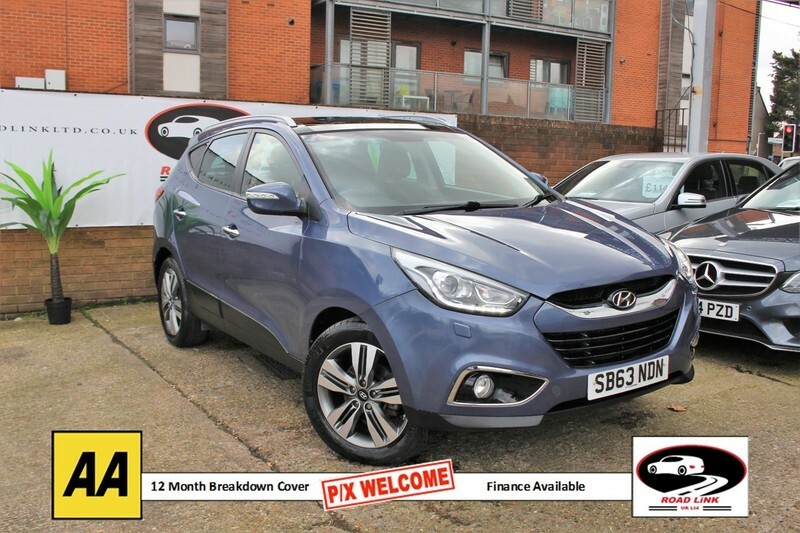 Hyundai IX35 1.7 CRDI PREMIUM PANORAMA - Hyundai has always been noted for its generosity when it comes to the standard kit count of its cars, and the ix35 is no exception to this. Comes with Satellite Navigation on 7" Touch Screen, Panoramic Roof, 17" Alloy Wheels, Full Leather Seats, Rear Parking sensors, Reversing Camera, Bluetooth., Heated Seats, Electric Memory Seats, Air Conditioning, Cruise Control, Speed Limiter, Xenon Headlights, Automatic Lights, Automatic Wipers, USB Connectivity, CD/MP3 Player, Daytime Running Lights, Front Fog Lights, Multi-function Steering Wheel, Power Assisted Steering, Electric Front & Rear Windows, Electric Folding Mirrors, Key-less Door Locks, Remote Central Locking, Full Service History, ABS, Tinted Glass, ISOFix Anchor Point, Brake Assist, Climate Control, Traction Control, Particule Filter, Free buying experience where you can drive away the same day. All our cars come with 1-year AA breakdown cover, HPI clear certificate and 3 months warranty, part-exchange welcome, finance available at best rate. We also offer 5 days drive-away insurance. At Road Link ltd we ensure that all of our vehicles are inspected and in great working condition. If you have any queries please contact us on 0208 848 3221 / 077 5666 5666 or via E-Mail.